stored away that you would like to share with the public but are concerned about loss or damage? 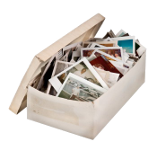 Have our team digitize these items into PDF/A documents that can be shared without the worries. All originals are handled with the utmost respect and care and you retain all rights to your items. We won't resell your data. Items containing text will be OCR'd to make the resulting documents fully text searchable. You will receive your digitized files back on Blu-Ray or DVDs. In addition, as a member of the project, your collection will be embedded into your existing web site. Your items are professionally scanned or photographed. Items containing text are OCR'd to support searching. The result is a PDF/A document that is suitable for archiving. The PDF/A documents are burned onto media and returned to you with your originals. Your website is automatically updated with the new data. Contact us and tell us what you have. We offer competitive rates on our services and a quote for your project is just an email away. References available upon request. Learn more about our unique solution that embeds your collection on your website.